Learn the secrets to losing 50 pounds, even if you're dieting and exercising and still not shedding that unwanted weight! Discover how to break that diet plateau in the next 10 minutes! If you're sticking to your diet faithfully but it's not working, or you're doing more running, aerobics or other exercise but you're still not losing weight, then you are probably feeling like nothing will ever get you into that little black dress or skinny swimsuit, get you noticed in the bar, or give you the energy to run about with your kids. Maybe your diet was working fine, until you hit a diet plateau and now nothing seems to shift the pounds, no matter how hard you try. You're frustrated and depressed, and feeling like giving up. Or perhaps you lost weight before but then you put it all back again, and as you've probably already found, with each successive diet, it gets harder to lose the weight. You know yo-yo dieting is just making your weight problem worse but you're feeling powerless to do anything about it. What you need is not a one-fits-all diet plan, it's a personalized action plan that recognizes you are an individual, with your own individual biochemical makeup. It's not more exercise, or diet pills, or advice on 'emotional eating' or ways to cut more calories, it's the know-how to identify the biochemical factors which are preventing you personally from losing weight and how to eliminate them. If, like me, you've been searching for answers to these problems, you'll know that it's very difficult to find them. I've been on diets for most of my life – and through most of that time, I was the classic yo-yo dieter. The standard doctor's low calorie/low fat diet; the boiled egg diet; very low calorie liquid diets; low calorie meal replacements; appetite-suppressing fiber supplements; high protein diets; fasting; prescribed weight loss pills; low carb diets; the Atkins Diet; the low GI Diet; WeightWatchers - I've tried them all. Jogging; swimming; aerobics; gym; power walking - I tried all those too, but they made little difference. Until I made a crucial discovery, that is - there are problems that can prevent you from losing weight that can't be fixed by simply dieting or exercising more. The rest is history. You wouldn't recognize me now - excess pounds gone, bags of self-esteem, energetic, feeling happy and healthy! The problem was that up until then I had been following the traditional advice that to lose weight, you should eat fewer calories and exercise more. But it isn't that simple. Eating less does not necessarily mean you lose weight. For example, too few calories can make your body think there is a famine and send you into 'starvation mode' by running more efficiently on fewer calories. Even the most commonly prescribed 'healthy weight loss diet' of 1200 calories a day can depress your metabolism in this way. Your body has other survival mechanisms in place, too, for instance to prevent you from losing weight if your levels of vitamins, minerals or essential fatty acids are poor. It is now known that many hormonal and biochemical factors can stop you losing weight. Yet most diet books and sources of official weight loss advice fail to recognize their importance. There are lots of other hormonal and biochemical factors which affect how and when you can lose weight. These factors can prevent you losing weight no matter which type of diet you're on, or how hard you are exercising. The significance of these biochemical and hormonal factors is only just starting to be recognized, and finding out about them was a true turning point in my life. I started to read the many books and papers written by doctors, nutritionists, dieticians, researchers, exercise physiologists and others who have taken a special interest in learning about how your body responds to weight-loss attempts. Initially, it all seemed a mass of confusing and often conflicting information, but eventually I began to piece it together and it all started to make sense. It had taken me many years to get to this point, and what I found was momentous. I discovered that there are 15 main reasons for weight loss problems, any or all of which could be affecting you. What my research taught me was that official healthy eating advice, which focuses on calorie counting and reducing fat, ignores the reality of how your body responds differently to different food groups, and to drastic or long term dieting. It ignores the fact that we are all individuals biochemically and that there can be no single diet that is best for everyone. Furthermore, official advice on healthy eating and dieting fails to recognize how nutritional deficiencies, allergies, toxic load, candida, stress, insulin imbalance, prescribed medicines, underactive thyroid, adrenal fatigue and many other factors can hinder your attempts to lose weight. After many hundreds of hours of researching the latest knowledge about these seemingly disparate conditions, it became apparent how they are all connected and can singly or collectively be the reason you can't lose weight. Many diet experts believe that up to 60% of people have difficulty losing weight on the high carbohydrate/low calorie/low fat diet that is currently promoted as 'healthy eating.' What this means is that many of us have been following advice that is wrong. The dieting population, and in particular, those of us who have special difficulty in losing weight, have quite simply been misinformed. If I had relied upon the information about how to lose weight that you find in doctors' offices, diet magazines and the media, I would never have solved my weight problem! If I hadn't spent all those years researching the real reasons for my weight loss problems, I would never have become slim. The amazing one third of my body weight that I lost totally transformed my life, and my only regret is that I didn't discover the real reasons why most diets fail many years earlier. That's when I knew I had to write a book a book to share this knowledge with you. It took me thirty years to find solutions for my personal weight loss problems. Although the clock can't be turned back on my own missed years, the low self esteem, the depression and the desperation of not knowing what to try next, you can avoid going through this same ordeal. I have found your book pulls together a lot of current thinking and answers a lot of questions for me. Thank you so much. This book is a must for anyone that has tried exercise and various diets but still can't lose weight. 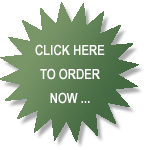 For years I have tried various diets which only provided short term success in weight loss. This insightful book has, at last, provided the answers needed to achieve permanent weight loss. It seems that most people have the same issue – it's easy to lose weight, but its much harder to keep it off and this book looks at this from a different perspective, so someone that has a real interest in finding out the cause of not keeping weight off will find the book really useful. My husband and I are both calorie counting and I was at a complete standstill plateau for about 3.5 - 4 weeks. I am now losing again thanks to the [calorie] "cycling" – I was just eating too few calories and walking a lot! Thanks again – we're appreciating the ebook! I found this book to be well researched and very readable, full of common sense and will provide inspiration to many. Overweight is not your fault! By the way, this book is not about blaming all weight problems on overeating, and it's not about blaming overeating on 'emotional' issues, either. For too long, overweight people have been told that their weight problem is caused by lack of willpower, weak character, or eating for comfort. The truth is that difficulty in losing weight has physical, not emotional causes. There are good physiological and biochemical reasons why your body may not allow you to shed weight at any particular point in time. Understanding this is crucial to succeeding on your diet. If you ignore the physical, biochemical factors which may be preventing your weight loss, no amount of dealing with 'emotional issues' will get those surplus pounds off! Nutritional deficiency is just one example of a problem you may have without realizing it, and which may be affecting your ability to lose weight. But it might not be the only factor. Your body is very complex and it works as an integrated whole. That's why trying different diets or exercise plans, weight loss pills and supplements, weight loss patches, 'fatburners' and 'miracle fast weight loss' products in a haphazard way is very unlikely to solve your problem. Just tackling one of the factors on its own may not be enough to trigger your weight loss. Here's the essential point about successful and permanent weight loss: you need a personalized, methodical process for identifying and eliminating all the potential factors that might prevent your diet or exercise plan from working. And that's exactly what you will learn in this book. In the book, you'll discover all these little-known yet critical diet saboteurs and how to eliminate them. You'll also get a summarized list of all the do's and don'ts from each chapter which you can use as a checklist to form the basis of your own personal 15-step action plan for weight loss success. You'll have the tools you need to lose weight permanently and safely, banishing your feelings of frustration at previous diet failures or weight loss plateaus once and for all! Losing weight is not the only benefit – you'll improve your long term health too! Following the principles in this book means that you are getting your body back into balance. When your body's fundamental processes and systems are operating as they are meant to do, you're much more able to resist chronic diseases such as diabetes, heart disease, cancer and arthritis. I'm really very impressed with "Why can't I lose weight?" by Jackie Bushell. This is not 'yet another miracle diet' but an up to the current moment comprehensive understanding of the underlying complex mechanisms that make up our metabolism, very clearly layed out and explained in easy to understand language. It makes for fascinating reading, explaining how our bodies evolved from early evolution to be adapted to their environment at that time and how our environment has now changed so fast our bodies have not kept pace. Moreover, there are many individual factors that influence the way we can successfully lose weight and different factors will influence different people. All we've done until now when dieting is follow what worked well for other people. No wonder people have failed time and time again! This book is the clearest and most complete work on the science of dieting that I have ever read, and is great to read cover to cover as well as serving as a reference source of information. Thanks for a brilliant book, Jackie! The book got technical things over in an easy to understand way. It was just as though you were talking to me in a conversation. What's unique about this book is that you will find unbiased information on the latest scientific understanding of how to lose weight successfully. There are no diet pills or foods to buy. This knowledge has not yet filtered down from the research world to mainstream medicine, government health departments, the media and the average man in the street. As a result, you won't have read this material in regular dieting books. But be reassured. The advice in my book comes from qualified doctors – the enlightened few, that is, who have taken the time to understand and treat the real root cause of weight loss problems. My book also stands out from the rest because it doesn't just focus on a single aspect or cause of weight loss. As we have seen, it is important to bring all aspects of your body's functions into balance to achieve real, permanent weight loss, and my book covers the whole range of scientific factors you'll need to consider in order to achieve your weight loss goals. Everybody should read this! It should be common knowledge. So much information but put in a straightforward manner. The sort of thing that should be on everyone's bookshelf. Now you can get all the right answers to solve your weight loss problem – without needing to do any of the research yourself! You could, of course, spend many years researching the answers. Well, I've saved you all that time and effort in my book, which is called "Why Can't I Lose Weight – The Real Reasons Diets Fail And What to Do About It". Following the right guidance will not only help you lose weight, but also save you money! If the saving of your time and effort on research isn't enough to convince you that getting this book will be the biggest good turn you ever did yourself, then take a piece of paper and note down everything that you have bought in the past in an attempt to lose your weight permanently. Here are some ideas to give you a start. The cost of visits to your doctor and of medications for obesity-related problems ($622). If you total all of these costs, they come to over $3,487 – and that's just for a single year! Then think of what you could do instead with this money – the money you'd save by learning the secrets to successful weight loss in "Why Can't I Lose Weight". You won't need to buy expensive diet pills and special diet foods or waste money on diet plans and slimming clubs which fail to work for you. Before I discovered what was preventing my weight loss, I was depressed, feeling a failure and desperate to find the answer. Now that I've discovered the secrets and researched and compiled the solution in "Why Can't I Lose Weight", I want as many people as possible to be able to solve their weight loss problems too. That's why I'm offering "Why Can't I Lose Weight" – it's 133 pages packed with solutions to help you lose weight and beat diet plateaus – at the highly discounted price of only . And because "Why Can't I Lose Weight" is a downloadable e-book, you won't have to wait for it to be shipped, so you could be getting started on this life-changing improvement in your health just minutes from now. PDF format is the most popular and compatible file format available, so the e-book works on just about any computer operating system. All you need is a copy of the free Adobe Acrobat Reader (iPad requires installation of a free PDF reader app). As an e-book it is planet-friendly (although you can easily print the PDF if you prefer to read a paper copy) and avoiding the printing, storage and shipping costs of a conventional printed book also means a lower purchase price for you. Once you've read "Why Can't I Lose Weight", you'll know which types of food are most likely to sabotage your diet. The next step is to ensure you know which products in the supermarket really are the healthy ones, and that you can make sense of the often disguised information on nutrition labels. 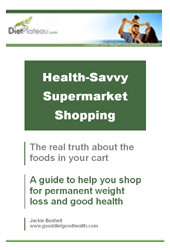 The Health-Savvy Supermarket Shopping Guide is an essential tool for healthy weight loss. A $19.95 value. There are varying views on whether 'fat burner' supplements work, and whether they are safe. This Guide will give you unbiased information on which supplements really work and are supported by clinical research into their safety and efficacy. Because it's so important to understand about fat burners, my "Guide to Fat Burner Supplements" is included as an appendix within "Why Can't I Lose Weight". A $9.95 value. Everyone is different biochemically, and what helps some people lose weight may not work for others. As the information is summarized in an easy-to-read way, you may also want more detail on the topics that most affect you. So included you'll find details of recommended websites and books for further reading as well as listings of the literally hundreds of medical books and journal papers which I researched in order to write "Why Can't I Lose Weight". These further resources are included as an appendix so that you can easily find further detail and the supporting evidence for the weight loss and plateau-busting secrets revealed in the book. A $19.95 value. 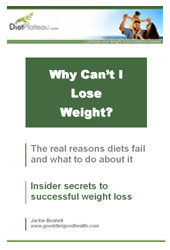 The total value of "Why Can't I Lose Weight" and all 4 bonuses is $68.85, but they are all included when you order the "Why Can't I Lose Weight" e-book for only . And that's all you pay - there are no shipping costs to add! "Why Can't I Lose Weight" also comes with a one year guarantee. We're so sure that you'll be satisfied with the weight loss secrets revealed within it that you can return the book anytime up to 365 days after purchase, and we'll refund your entire payment. So there's no risk to you, and nothing to lose – except weight! P.S. "Why Can't I Lose Weight" reveals the weight loss secrets which you need to know about to conquer your weight loss problems and break your diet plateau or stall. Painstakingly drawn together and interpreted for you from hundreds of hours of research, the book also includes a 15-step Personal Action Plan for Weight Loss Success. This will help you translate the secrets you will learn into specific actions, personalized to your own biochemical individuality, to help you start solving your weight loss problem today. And what's more, nothing in this book involves losing weight at the expense of your long term health. Quite the reverse, in fact. If you follow your personalized Action Plan, you will already have immeasurably improved your chances of a healthy life. "Guide to Fat Burner Supplements"
"Further Resources and Weight Loss Know-How"
What have you got to lose, except weight!